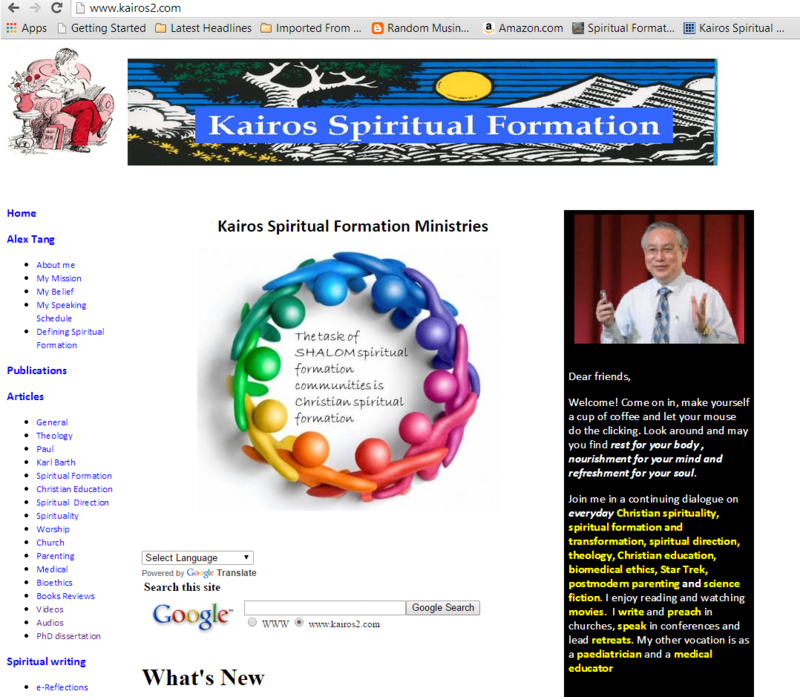 I started the Kairos Spiritual Formation website in 2006, starting from a scratch using Microsoft FrontPage and a couple of website building guide books. It was an exciting challenge for me to learn programming language and website design. That is almost 10 years ago. I have been continuing updating the website on a weekly basis, adding all my writings, reflections and other stuff. In these years, website designs and language has changed tremendously. Microsoft Frontpage has been discontinued by Microsoft when better and more user friendly website builders became available. Many nowadays do not require the knowledge of any language. I find my Kairos Spiritual Formation website very useful. Though it has an aged look to it, it still serves me well as a resource and hopefully to others out there. The original purpose of this website is to serve as a free resource on spiritual formation, spiritual direction, engaging culture, spiritual nurture and other areas I am interested and is researching in. I have considered updating it but the website has ballooned to about 9,800 files! I once consulted a website designer to upgrade the website but the poor guy turned pale and ran out of the room. I guess it will not be easy to upgrade such a large website. Since it is difficult to upgrade, I have decided to maintain it as long as possible. Microsoft has since stopped servicing and updating its Frontpage. I know the title is a bit Kuyperian and Ignatian. Will I be transferring all my files to this new website? I am not too sure I want to do that for two reasons. One is that it will involve a lot of work and time to manually transfer the files. I know there are programs to do that but so far these program do a reasonable transfer but often mess up the files. The second reason is that I am afraid that by the time I have finished updating the new website, a new generation of website will have arrived with more bells and frills. I know how that feels. I still have old cartridge tapes, LD, VCD, DVD, HDVDV and now Bluray of the same movies! 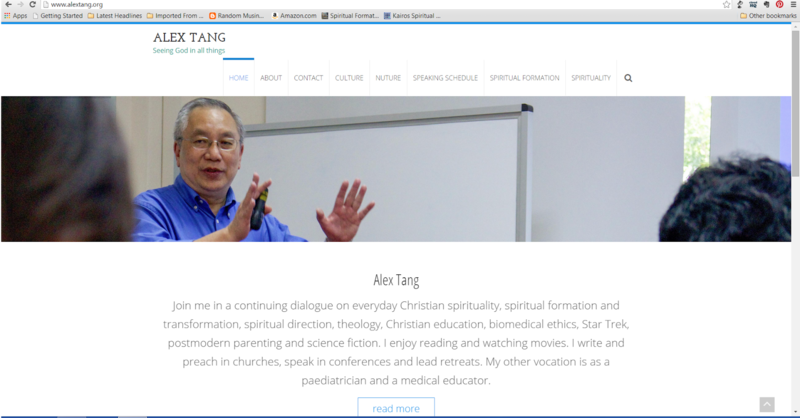 Do come and visit my new website at http://www.alextang.org while my old website http://www.kairos2.com is still open for business. Shalom and welcome. The economy has changed, probably forever. School was invented to create a constant stream of compliant factory workers to the growing businesses of the 1900s. It continues to do an excellent job at achieving this goal, but it’s not a goal we need to achieve any longer. In this 30,000 word manifesto, I imagine a different set of goals and start (I hope) a discussion about how we can reach them. One thing is certain: if we keep doing what we’ve been doing, we’re going to keep getting what we’ve been getting. Our kids are too important to sacrifice to the status quo. Here, Godin questions the schooling instructional paradigm. It is interesting to note that while most disciplines (medicine, social sciences, humanities) have moved away from this paradigm whose main mode of pedagogy is the lecture, this seems to be the mainstay in theological education. There seems to be a lot of support for the lecture as the main mode of content transference. However there may be another agenda for the theological professors’ support of lectures. Some professors have indicated in private discussions that their sole support for the lectures is that in preparing lectures help them in writing their books! Research shows that Christian, particularly evangelical, institutions demonstrate a marked moral difference in five areas: (1) faculty attitudes; (2) Bible, theology, and ethics in the curriculum; (3) measured or reported impact on character or moral attitudes; (4) students’ moral reasoning; and (5) alumni views about moral education. Is there a conflict in both views? If both authors are correct, then the implication to me is that theological education should be more than just the the pedagogy. Yes, I agree with Godin that the schooling paradigm as the main mode of pedagogy should be abandoned. But that is not the the whole answer to improving theological education. The key to theological education should not be only be content management but also role modeling by the teaching staff , the community ethos (culture) and relationships building in a Christian faith community. Spiritual Formation and Christian Education: Are We Talking about the Same Thing? There has been some confusion regarding the term spiritual formation and Christian education. In this post I will attempt to (1) differentiate between the two and also (2) identify when the two terms may be considered synonymous. The meaning of the term “Christian education” or “religious education” or “Christian religious education” has over the years become expansive and ambiguous. Christian education is commonly associated with classes, resources, time-limited courses, the need for more trained teachers and teaching materials; most of these activities are conducted on Sunday in the church grounds using church facilities. Many educators have tried to map Christian education over the years in attempts to appreciate the diversity of the term. American Catholic educator, Mary C. Boys, in her seminal study, Educating in Faith, tries to map it into four categories: (1) evangelism, (2) religious education, (3) Christian education, and (4) Catholic education (catechetics). She approaches the subject from a historical and conceptual framework (Boys, 1989). Johnson is correct in her assessment as the theme of spiritual formation become stronger when Seymour (1997) re-examines Christian education 15 years later in Mapping Christian Education: Approaches to Congregational Learning. Here he maps Christian education into four themes: (1) Transformation; (2) Faith community (3) Spiritual growth; and (4) Religious instruction. Compared to the 1982 survey, the approaches of liberation and interpretation appeared to have been integrated into transformation. Transformation which has the goal of “assisting people and communities to promote faithful citizenship and social transformation” is a better category that includes liberation and interpretation (1997, 21). Christian education is the deliberate, systematic, and sustained divine and human efforts to share or appropriate the knowledge, values, attitudes, skills, sensibilities, and behaviours that comprise or are consistent with the Christian faith. It fosters the change, renewal, and reformation of persons, groups, and structures by the power of the Holy Spirit to conform to the revealed will of God as expressed in the Scriptures and pre-eminently in the person of Jesus Christ, as well as any outcomes of that effort (1997, 87). Christian education according to Pazmiño is more than schooling but less than socialisation. It emphasises the intentionality of a cooperative activity between persons and God. This activity includes the efforts to share the context of the Christian faith through the power of the Holy Spirit with preaching Jesus Christ as a goal. There is no emphasis on spiritual growth of the inner person, role of the church, and building relationships with other persons though those may be implied. Catholic educator Thomas Groome defines Christian religious education “as a political activity with pilgrims in time that deliberately and intentionally attends with them to the activity of God in our present, to the Story of the Christian faith community, and to the Vision of God’s Kingdom, the seeds of which are already among us” (1980, 25). His definition highlights the intentionality of religious education, being sensitive to God, the Christian story, and the goal of the kingdom of God. The methodology of his religious education is shared praxis. There is the emphasis on community, shared practices, and working towards a common goal – shared praxis. Socialisation or enculturation is the approach adopted by several Christian educators. One of them, Westerhoff III, defines religious education as “all those formal and informal influences through which persons acquired their understanding and ways of living…deliberate systematic, and sustained efforts within a community of faith which aim at enabling persons and groups to evolve particular ways of thinking, feeling, and acting” (2000b, 14, 579). This is based on his theory of enculturation where a community nurtures and helps its members to develop a particular pattern of being. He calls it “catechesis” or Christian formation. Westerhoff builds on C. Ellis Nelson’s ideas about socialisation. His approach is based on the community of faith. He subsequently influences Craig Dykstra (1978) in his works on Christian practices in congregations. I find the Christian education model of socialisation/enculturation closest to my concept of Christian spiritual formation. I define Christian spiritual formation as the intentional ongoing process of the inner transformation of the character of a person to become like the character of Jesus Christ himself, of becoming with others a community of the people of God, and of becoming an agent for God’s redemptive purposes. While the elements of spiritual formation are present in Christian education, Christian spiritual formation is only synonymous with the socialisation model of Christian education. Boys, M. C. (1989). Educating in Faith: Maps and Visions. Lima, OH: Academic Renewal Press. Dykstra, C. (1987). The Formative Power of the Congregation. Religious Education, 82(4 Fall), 530-546. Groome, T. H. (1980). Christian Religious Education: Sharing Our Story and Vision. San Francisco, CA: Jossey-Bass. Johnson, S. (1989). Christian Spiritual Formation in the Church and Classroom. Nashville, TN: Abingdon Press. Pazmiño, R. W. (1997). Foundational Issues in Christian Education (2d ed.). Grand Rapids, MI: Baker Books. Seymour, J. L. (Ed.). (1997). Mapping Christian Education: Approaches to Congregational Learning. Nashville, TN: Abingdon Press. Seymour, J. L., Miller, D. E., Little, S. P., Foster, C. R., Moore, A. J., & Wehrheim, C. A. (1982). Contemporary Approaches to Christian Education. Nashville, TN. : Abingdon Press. Westerhoff, J. (1976, 2000). Will Our Children Have Faith? (rev. ed. enl.). Harrisburg, PA: Morehouse Publishing. In some countries, religious education refers to education in schools. In Malaysia, there are only one or two “Christian” schools which offer the national education syllabus with one or two religious subjects and chapel services. In practice they are closer to the National Type schools than to schools offering “(Christian) religious education”. I find this comment by Dallas Willard on his homepage of his website very relevant. My sense of ministry is to judge the lay of the land for your times and shoot where the enemy is. The enemy in our time is not human capacity, or over activism, but the enemy is passivity – the idea that God has done everything and you are essentially left to be a consumer of the grace of God, so the only thing you have to do is find out how to do that and do it regularly. I think this is a terrible mistake and accounts for the withdrawal of active Christians from so many areas of life where they should be present. It also accounts for the lack of spiritual growth, for you can be sure that if you do not act in an advised fashion consistently and resolutely you will not grow spiritually. In an interesting article published in Medscape on Training the Physician and the Anesthesiologist of the Future by Alex Macario, MD, MBA the training program of anesthesiologists is presented. Figure 1. 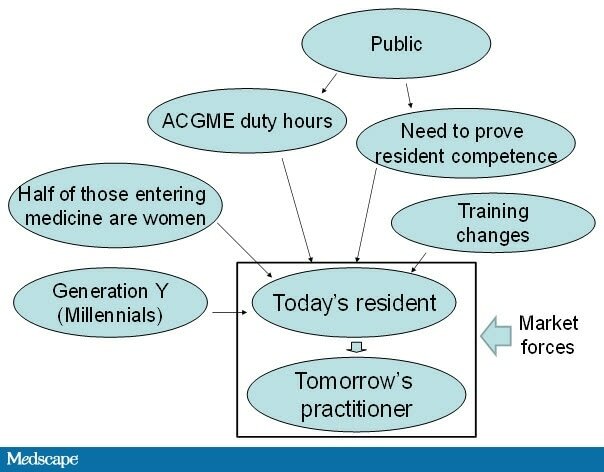 Factors that influence the changing physician workforce. However I am more interested in the way he discerns the different demographic of the various groups of people involved in the training. This has relevance not only in the training of physicians but also of other areas including theological education. Figure 2. Recent generations by year of birth. Alex Macario’s study is focused on the United States but his characteristics of Generation Y is fascinating and will be useful for educators elsewhere in the world. Many millennials (42% of women and 30% of men) talk to their parents every day and many are still financially dependent on their parents; this has led to a new acronym: KIPPERS (Kids in Parents’ Pockets Eroding Retirement Savings). As the skills required for certain jobs become more specialized, many young people return to school for professional degrees with the hope that this additional training will help them land a job. This creates more dependence on others, such as their parents, for financial support. Education and training in the present have to be designed to factor in the demographic of the millennials if these programs are to be successful. 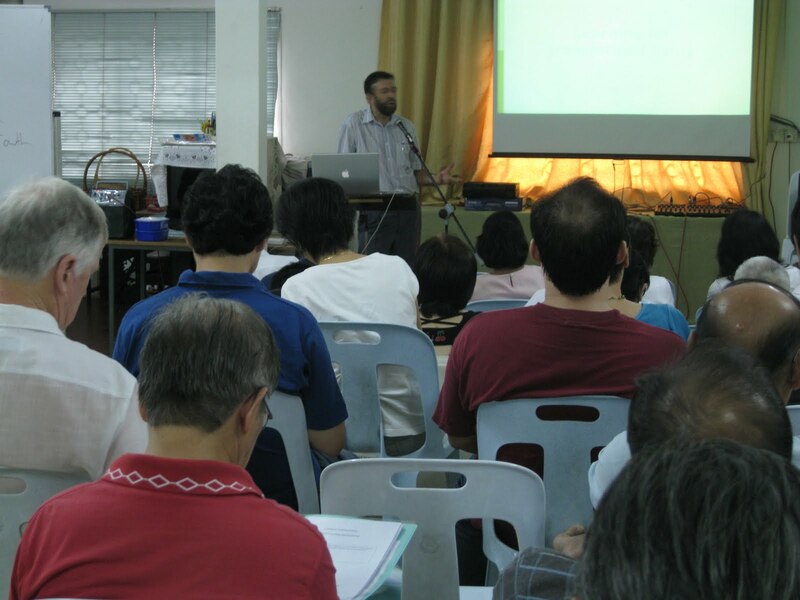 General education in Malaysia is deeply influenced by the state schools system in Britain and the church Sunday school movement. The state schools in the British Isles, which adopted the schooling-instructional model, were developed in 1870s to efficiently train a workforce to be minimally literate for the industrial revolution. Australian educator Brian Hill calls this “schools for the industrial society” (1985, 42). The Sunday school movement was started earlier in the 1780s and was influential in teaching children how to read, write and numeracy skills as well as learning about the Christian faith. In the nineteenth century, after its formation the state schools began to take over the function of the Sunday schools in teaching the children in the 3 Rs (writing, reading, arithmetic). The Sunday schools gradually began to focus solely on religious education. However, following the state schools, they adopted the schooling model (Hill 1985, 46). During the nineteenth century, the schooling-instructional paradigm found its way into other formative areas of Christian faith communities and gradually became the mainstay of education in Christian faith communities. Alan Andrews (ed. 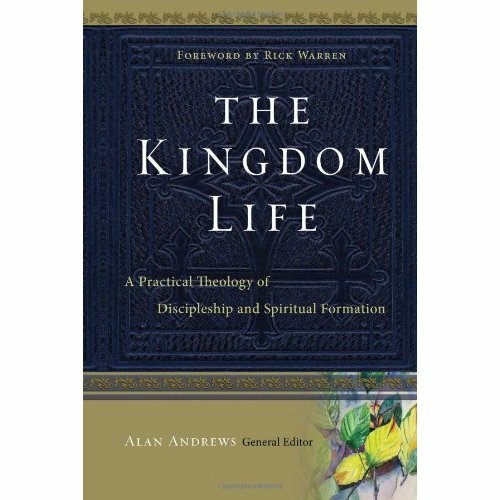 ), (March 2010), The Kingdom Life: A Practical Theology of Discipleship and Spiritual Formation, Colorado Springs, CO: NavPress. It is heartening to note that there are many new books on spiritual formation that moves beyond teaching spiritual disciplines and a contemplative life to engage on the theology of (Christian) spiritual formation. 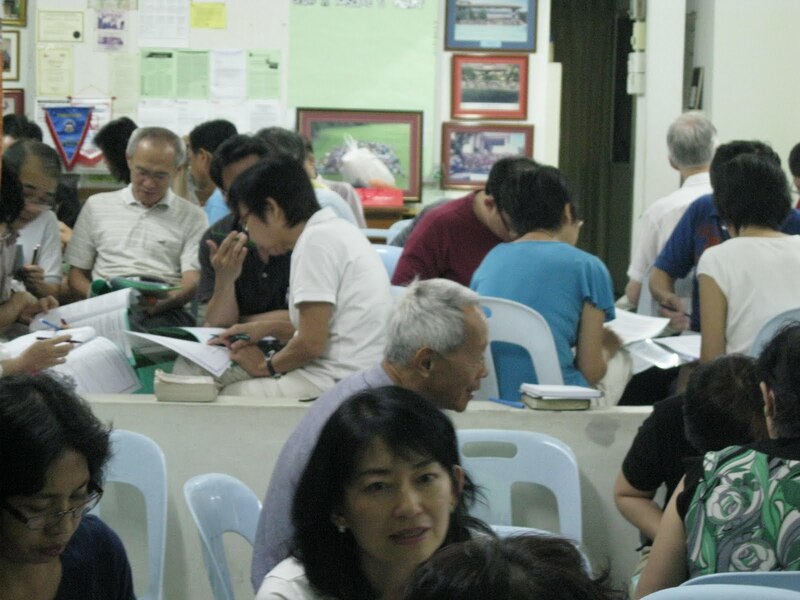 In September 2002, a group of theologians, pastors, authors and church leaders got together to form the Theological and Cultural Thinkers (TACT) group to serve as a think tank on spiritual formation. This book which is a collaborative effort of some best in the field which reads like a list of who’s who in spiritual formation and discipleship: Dallas Willard, Bill Thrall, Bruce McNicol, Keith Andrews, Bill Hull, Keith Meyer, Peggy Reynoso, Paula Fuller, Bruce Demarest, Michael Glerup, Christopher Morton, Richard Averbeck and Alan Andrews. The gospel of the kingdom is the realm of God’s active goodness in forming us in Christ as we follow Him. The kingdom of God is grand, majestic, and full of beauty. We come to understand the kingdom by repenting and simply becoming apprentices of Jesus in His kingdom. Spiritual formation is rooted in relationship with God and one another. Communities of grace and trust open the door to gaining permission to share truth among fellow believers and the unbelieving world. Spiritual formation into Christlikeness involves an intentional public, personal, and communal commitment to living as Jesus’ disciples who are being transformed into His image in all aspects of our lives as we learn to obey His commands. Spiritual formation is a lifelong pursuit of being conformed to the image of Christ from the inside out and not a matter of external activity alone. Spiritual formation is a continual process of transforming the whole person, including the healing of woundedness and rebellion, by the power of God, not to be confused with mere technique or program. Spiritual formation occurs when God, in His grace, invades the destructiveness of suffering that result from the fall of man and uses the pain of suffering that results for His redemptive purposes in His people. There is also unique suffering that shapes the formation of believers as they enter into the call to love a lost world and the inevitable suffering that result from that love. Spiritual formation in Christ is a process of growing in kingdom living and participating in God’s mission. This begins with our personal reconciliation with God and results in an irrepressible manifestation of God’s good news. 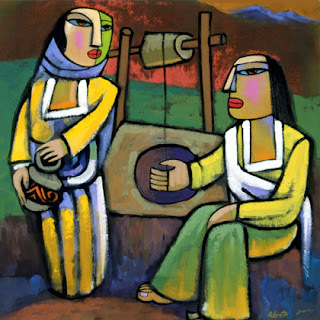 Disciples of the kingdom labor in community for reconciliation with God and one another as a central priority of mission. They also pursue justice and compassion for all people and work to correct institutional sin inherent in human structures. The theology of spiritual formation emerges from the Trinitarian nature of God – relational, loving, gracious, mutually submissive, and unified in will. Spiritual formation takes place by the direct work of the Holy Spirit, regenerating and conforming us to the image of Jesus Christ as the Spirit indwells, fills, guides, gifts, and empowers people for life in the community of faith and in the world. Spiritual formation is based upon the Bible as God’s reliable and authoritative revelation. The Bible, our primary source of truth, guides and informs the use of spiritual disciplines and models of spirituality as they have emerged worldwide and throughout time. These key process elements of spiritual formation as highlighted by TACT is an intentional lifelong process that transforms with suffering as one of the agents of learning and with healing of “woundedness and rebellion” of a person from “inside-out” to the image of Christ. This involves “kingdom living and participating in God’s mission” and is lived out in communities and in relationships with others. The basis is the nature of the Trinitarian God and is the direct work of the Holy Spirit with the Bible as God’s revelation. While it is crafted by Evangelical authors based upon churches in the United States in North America, it nevertheless represents most of the universal elements of spiritual formation. Unfortunately they are not able to totally dissociate themselves from their cultural context of individualism. While there are references to the community, the process elements are more suited for spiritual formation in individuals who together with other individuals undergoing the same process are involved in building communities and missional ventures rather than the communities themselves have a role in the formation It is about “persons-in-communities” rather that “persons-of-communities.” Communities, especially Christian faith communities should have a bigger role to play in the TACT perspective. Spiritual formation occurs in believers as they engage in intentional personal formation, community formation and missional formation. These three dimensions of spiritual development must not be compartmentalized or separated but organically connected. The center of the spiritual-formation church is Jesus and His kingdom. The Bible is a Christocentric book. Jesus’ primary message was about the immediate nearness and availability of His kingdom to us. Every spiritual-formation church must be rooted in the soil of the lost, the vulnerable, and the least. The spiritual-formation church should seek to create an environment of grace that welcomes everyone who will come to the “rivers of living water” (John 7:38, NASB) that resides in the culture of God’s kingdom. The spiritual-formation church must seek to reach, teach, and practically engage the people in spiritual formation. This means intentional spiritual formation must be the central passion of the church. Equipping people for ministry is critical to the health of the spiritual-formation church. The spiritual-formation church develops new leaders for the advancement of the gospel and the spiritual formation of the people of God. The Bible uses multiple metaphors to describe the people of God, but the primary descriptors are organic – for example, body and family (p. 301-312). Andrews and Morton pointed out correctly that “intentional spiritual formation must be the central passion of the church.” The central passion of the spiritual-formation church is the place for “intentional personal formation, community formation and missional formation.” This implies that the spiritual-formation church is not just a place where believers practice the spiritual disciplines and be missional. It means more than that. The question to be asked is whether the present institutional church with its formative practices is the ideal model for spiritual formation and discipleship to take place. Is there a need to reorganize the formative practices and even the structure of the church itself? These are important questions if the central passion of the church is intentional spiritual formation. There has been much confusion about the meaning and usage of these words: discipleship, spiritual formation, and Christian spiritual formation. These words are sometimes used interchangeably by some teachers while others offered a more nuanced definition. Here I will offer some definitions of these terms. Spiritual formation is the process of forming our inner spiritual beings (soul) which manifest outwardly as our character. This is an ongoing process which starts when we are in our mothers’ womb and continues until we die. There are numerous influences that affect our spiritual formation which includes our cultural legacy, our childhood experiences, our ethnicity, the socio-political environments in which we live in, the dominant culture in our society, and our social interactions with other people, including our family members. Often these influences act subconsciously by a process of socialization or enculturation. In other words, all of us are undergoing spiritual formation all the time, whether we are conscious of it or not. Christian conversion (accepting Christ) involves a change in status by our justification by faith, and of the formative regeneration of our souls (sanctification). Christian spiritual formation starts after conversion. Christian spiritual formation is the process of the redemptive inner transformation of the character of a person to reflect the character of Christ himself. There are two components to Christian spiritual formation: (1) the work of the Holy Spirit, and (2) the willingness of a person to follow Christ in discipleship. Christian spiritual formation is a collaborative divine-human interaction. 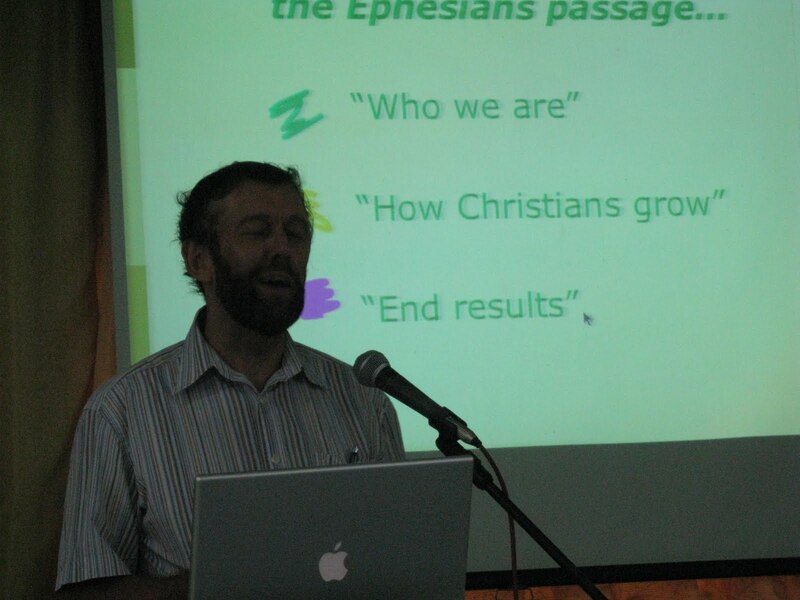 The influences that act on Christian spiritual formation are similar to those experiences by all living human beings. Additional influences are the formative practices of the Christian faith communities (Christian education) and the Word of God. Discipleship is the part of Christian spiritual formation where we can be actively involved in. The Holy Spirit is ever willing to be involved but respect our choices and will not force us to be disciples. Discipleship is following and obeying the teachings of Jesus Christ and in doing so, we become Christ-like in our character. Jesus summarizes this by saying that, “If anyone would come after me, he must deny himself and take up his cross daily and follow me” (Luke 9:23). To be his follower, Jesus points out that there is a part about denying self, and there is another part about following him. Luke helpfully gives us some essential features on discipleship. These essentials are trust (Lk 9:37-43); suffering (Lk 9:44-45); humility (Lk 9:46-50); purpose (Lk 9: 51-56); commitment (Lk 9: 57-62); involvement (Lk 10:1-20), and prayer (Lk 10:21-24). However all these need the work of the Holy Spirit if Christian spiritual formation is to take place. We cannot will or discipline our bodies into spiritual transformation. The purpose (telos) of Christian spiritual formation is three-fold reflecting the economy of the Triune God. Christian spiritual formation is (1) to restore image of God (imago Dei) within us so that we reflect the character of Christ; (2) to form a people of God –the body of Christ; and (3) to be part of God’s plan of reconciliation with all of creation (missio Dei). Christian spiritual formation is Trinitarian in basis as it is an invitation to join in the perichoresis or eternal dance of God the Father, Jesus Christ the Son, and the Holy Spirit. 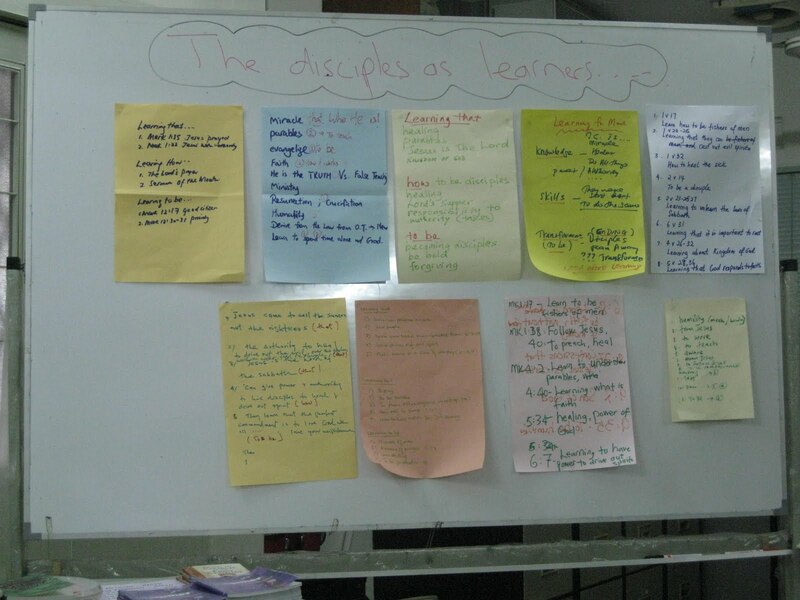 Learning strategies for disciples of Christ, and relevant approaches for those who teach them. 1. Learning that transforms: the nature, features and ecology of life-long and life-wide learning to be a disciple of Christ; and strategies to enhance that learning. 2. Teaching for transformation: principles and strategies for those who encourage others to be effective disciples of Christ, whatever age they are. 3. The Bible and prayer as transforming agents. Dr Allan Harkness, from New Zealand, has lived in Singapore for some years. A member of OMF International, he is currently heading up AGST Alliance, a SE Asian regional post-graduate theological study venture. Allan has a passion to see God’s people of all ages formed and equipped together for effective service through the creative expressions of the Christian disciplines and through informed educational strategies which enable life-long and life-wide learning. This is a book I am looking forward to reading. I like the way James Smith challenges our modernist thinking and our way of doing Christian education. My copy from Amazon.com is on the way and I am impatiently waiting for its arrival. There’s something more important than our intellectual framework. Worldview has been Christian education’s byword, codeword, password, keyword, and—for some students—swearword for the past 30 years. Amid the modern cacophony, it has provided a rhetorical and philosophic unifying point for academic communities badly in need of the singularity and depth of vision their mission statements proclaim. So why in Desiring the Kingdom: Worship, Worldview, and Cultural Formation (Baker Academic) does philosopher James K. A. Smith call for a “temporary moratorium” on this hallowed notion? If educating is indeed about properly ordering our loves, as Smith (following Augustine) believes, then formation rather than information should become the primary end of our institutions.